In January 2002 the thing I wanted most in the world was a “hold” button. But, hey, it was a disaster. I mean really a disaster: I was working for the American Red Cross Disaster Services, we were crazy busy, but I was sharing a phone with four other colleagues in a large, bare-bones office. I’ve worked in non-profit organizations most of my career, and fortunately for me most of them have been large and well-funded, including the American Red Cross. But comparing my non-profit experience to my rare forays into for-profit work, it is impossible to imagine working in any for-profit corporation for six months without a hold button on my telephone. Never mind that the phone was on a plastic folding table, not a desk, so I didn’t have a desk drawer, either. The cultural divide isn’t always so extreme, but there are certain things that can happen in one world that are unimaginable in the other. I eventually got a phone with a hold button; then we moved to a new location with a fancy VOIP telephone system. Less than two weeks after the move the northeastern United States experience a major blackout and the phone system went dead, along with the computers, lights, elevators, everything. We had zilch. It was a reminder that while high-tech tools are nice, we are wise not to depend too heavily on them. 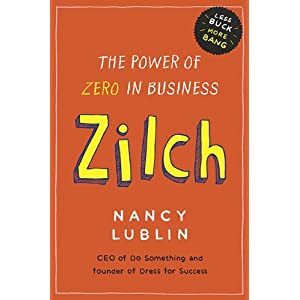 Nancy Lublin’s book Zilch: The Power of Zero in Business, explores the differences and shows what for-profit businesses can learn from the non-profit world. It’s not so much about learning to get by with princess phones and folding tables, but to maximize resources, be flexible in work processes, and always keep your primary goals in focus. Indeed, while for-profit companies exist to make money, non-profits exist to spend it on whatever mission they serve. The Internal Revenue Service rules that define a tax-exempt charitable organization—known as a 501(c)—require that organizations spend 5% of their money annually on programs, services, grants or other charitable work. And while non-profits are permitted to charge fees for some of their services, there are limits on how much income can come through sales not related to their mission. How, then, do non-profits get the money they need to operate? This is the amazing part: people give money to non-profit organizations just because they want to! (OK, some do it for a tax break, and a few want the tote bag or newsletter.) Donors have an idea about what they want their donation to do, and they will give to the non-profit that, in their opinion, does it best. Part of doing it best is being dedicated to the mission statement, and another part is being efficient with money and other resources. That’s where Zilch comes in—although no organization can truly afford to operate on zero dollars for long. Non-profits maximize their dollars by making use of free or nearly free resources wherever they can. That’s why so many rely on volunteers: people who care enough to work without pay are usually a good deal, even if they can’t work a full-time schedule. They’re the ones who will not only help out in the office when they can, but will wear the organization’s t-shirt and tell their friends about what they do. They become ambassadors for the cause. Lublin uses Feeding America as an example of an organization that has found an excellent spokesman and advocate in actor David Arquette, but they found almost as good a listener in me. You want to know how good word of mouth can be? Volunteering on a Red Cross call center following hurricane Katrina, I referred callers to many organizations beside our own. One of the most frequent requests was for food assistance, so I looked up food banks affiliated with America’s Second Harvest (as they were known then) all over the country. I didn’t keep track of how many people I referred to their locations, but I know one thing: nobody ever told me they’d already tried and been turned away. That positive feedback, knowing that nobody had anything bad to say about Second Harvest, even under difficult circumstances, prompted me to be an occasional donor. The American Red Cross gets my time; Feeding America gets a little of my money. How’s that for a partnership? Non-profits often make use of partnerships. My disaster experience demonstrated that—there are so many organizations that work in disaster relief that they’ve formed an association. Each one has its niche, the thing it does better than anyone else. They cooperate rather than compete (although non-profits do occasionally compete for funding) and it can make everyone more effective. Lublin encourages non-profits to partner among themselves and with for-profit companies. Partner with the obvious organizations and also with the less obvious—but never partner with anyone who could damage your own reputation. As I learned, Feeding America was one organization I could refer callers to without worry, and their mission aligned perfectly with one of the greatest needs of those who evacuated after hurricane Katrina. But if callers had complained, if they’d had bad experiences with a food bank that the American Red Cross sent them to (because that’s how they saw it), our reputation would have suffered, too, for not realizing that there was no help to be had there. They have to show they are the best deal going on warm fuzzies. With nothing tangible to give the donor in return it is essential to show that their donations are used wisely. It’s not quite getting by on zilch, but the best non-profits can squeeze every last drop from a dollar. Nancy Lublin reminds me how and why we do it. Previous Article Can You Pass a Turing Test? Next Article Is Twitter a Virtual Soap Box or Town Hall?